Home / Epson / Epson Dot Matrix / Epson FX-890 / C13S015329 – Genuine Epson Black Ribbon Cartridge – delivered FAST & FREE! C13S015019 – Genuine Epson #8750 Black Ribbon Cartridge – delivered FAST & FREE! 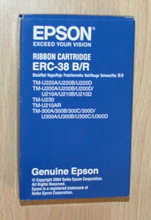 ERC-38 – Genuine Epson Ribbon Cartridge – delivered FAST & FREE! T5846 – Original Epson 150 Sheet Cartridge & Paper Pack	 C13S015255 – Genuine Epson High Yield Replacement Ink Film – delivered FAST & FREE!